Have you seen the "Life of Pi" movie yet, or read the novel? I was something of an early adapter to both, my enthusiasm to head for the movie theatre inspired by my love of the book, with its dramatic arc (boy shipwrecked at sea and at the mercy of the Pacific Ocean for 200+ days), clever naming of characters, complete with universal implications and double meanings. Pi and infinity, and the contrast of the mundane name "Richard Parker" given to an exotic computer generated Bengali tiger. Then just before the wrenching drama's conclusion, the hook at the end of the novel, throwing the reader an alternative scenario of what could have really happened. It's an almost Madison Avenue-like tagline that truly reels us in (no pun intended), and its own modern take on user generated content, as the adult narrator looks back and makes us an offer: which story do you prefer? Of course, there are many great lessons, metaphors, and questions raised by this book, which does what all timeless stories and works of art do: inspire the conversations, ask the tough questions, and make us rethink our suppositions about life, religion, survival, values, etc. So, it was only, shall I say, organic, that apart from the fictional aspects of the story, a number of business lessons became apparent to me upon further reflection after seeing the film. The more I thought about them, the more the amazing parralels came as a surprise even to myself. Here is the quick rundown, and you may recognize that some ring true for you as well. Almost immediately after Pi finds himself stranded in the Pacific with Richard Parker, and the assorted animals that will not make it past the first few days, he creates ways to quickly adapt to his environment. In order to safely distance himself from Richard Parker, he positions the tiger on the raft and himself on a block of plywood he manages to assemble. This will of course change later on, but he establishes what he needs to survive first, capturing fresh rainwater through a siphon system he creates, and catching fish through a net he assembles. Eventually, he learns to create shade with a leftover tarp, and creates a head turban with his shirt as further protection from the sun. Ironically, from a writer's point of view, one of the tools he seems to value the most is a tiny worn out pencil that he uses to record the details of his plight, and which he meticulously sharpens with a knife until it's gone. The toolkit then: knife, tarp, netting, clothing, food and water, pencil and paper, plywood. How do you need to adapt to make your business or position work, and what does your toolkit consist of? Pi immediately develops rituals for survival, and when he finds what works, he sticks with it. Conversely when something doesn't work, he lets it go. Catching fish and securing rainwater, keeping a safe distance from Richard Parker and eventually learning to train him enough so they can coexist, these become Pi's rituals. 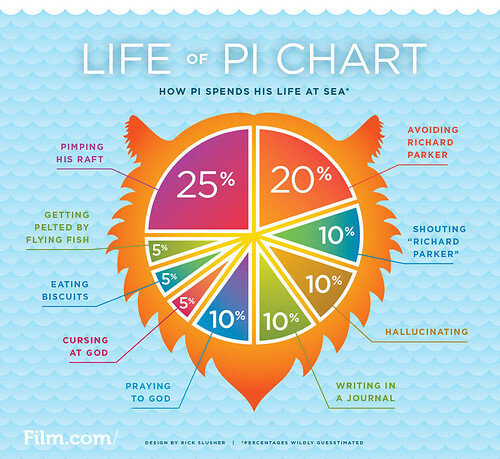 Check out this amazing infographic that diagrams the way Pi spent his time while stranded at sea! What rituals work in your business? What must you do each day, and what can you let go of? Even at the height of Pi's demise, he still wonders at the events of the natural world that unfold before him -- the flying fish sequence will probably become known as one of the most iconic in film history, not only for razor sharp precision of the images, but the way it takes Pi and the audience by surprise. Similarly the whale sequence, in which the giant mamal circles the boat and creates magical arcs against a surreal horizon and night sky, is a moment of wonder and amazement. What fascinates you and makes you passionate about your business? Are there small miracles in your niche or industry that keep you inspired and engaged? Everyone at some point is afraid of something, whether it's a life or death scenario, making a speech in front of a huge crowd, trying a new strategy or approach, or traveling to a different part of the world. Pi uses his fear to help him survive by staying awake as much as possible, paying attention to his surroundings, and connecting with his survival instincts. In many ways, his fear is what keeps him alive. It may sound cliche, but failing to confront our fears is probably one of the key barriers to success. How can you use your fears in a constructive way, to move forward professionally? One of the fascinating elements of "Life of Pie," is that it is a story inside a story, inside yet another story. The novel is framed by a note from the author, Yann Martel, who describes how he first came to hear the fantastic tale of Piscine Patel. Within the framework of Martel’s narration is Pi’s fantastical first-person account of life on the open sea, which forms the bulk of the book. At the end of the novel, a transcript taken from an interrogation of Pi reveals the possible “true” story within that story: that there were no animals at all, and that Pi had spent those 227 days with other human survivors who all eventually perished, leaving only himself. This references the which story do you believe question I mentioned at the beginning. But at the end of the day, that's not really the point. The point is that the reader or viewer stay so loyal to the storyteller and his or her authenticity, that either story is palpable, and that there are enough truths to be credible. Of course in business, being authentic and credible are key. What is your story and how can you best tell it? Do you understand that your audience needs to hear it more then once? Does your story help your audience identify with you and establish a connection? We are all taught certain lessons growing up. We are told the world is one way, and yet we may experience it another way, or a myriad of ways. We grow and shed our beliefs over time, like a second skin. Pi is taught early on in Pondicherry at his father's zoo, that the tiger Richard Parker cannot be tamed. And yet once adrift in the Pacific, he knows that if he and the tiger are to co-exist, the tiger must and can be somewhat trained...at least enough for both man and tiger to establish boundaries and, as Pi narrates, "a way to communicate." It is also implied that Pi's belief in multiple religions and of course, in God, saves him as well. After all, the promise of the story is to make the writer, and the reader, believe in God, or at least a higher being. Promise fulfilled. Are there beliefs you have always been taught that you now need to challenge? How are they helping or hurting your business or even personal success? Can you afford to let them go, even for a trial period? 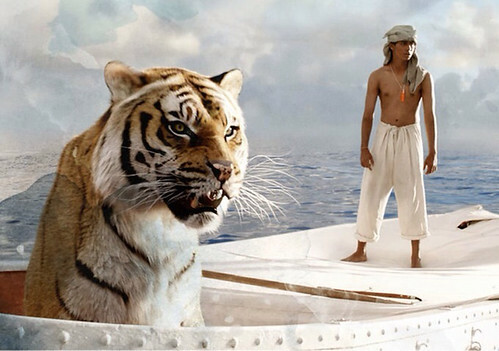 The "character" of Richard Parker, presented as a very convincing computer animation, serves as a foil to Pi. The tiger could attack at any minute, but over time proves a necessary companion, keeping Pi alert and focused. He preserves the tiger, and thereby himself, and so it proves a symbiotic relationship, and the two form on oddly suited pair of partners on their terrifying journey. Richard Parker becomes increasingly human as the film and story develop, and by the end when he disappears into the forest, without even a goodbye or backward glance "after having gone through so much together." It is a strange ironic twist, and something of a "Born Free" learning to let go moment. Richard Parker's unsentimental exit keeps the story from growing sentimental, and keeps it real, so to speak. Real or imagined, stuff happens, and we have to move on. Who are you partnering with in your business? Do they bring a different perspective and set of skills to the table? Do they keep you challenged and alert? Measurement and the passage of time is a huge element in Pi's story. He marks the days in his notes, and throughout the narration references how much time has passed. It makes the story that much more remarkable and critical, successfully suspending our belief that anyone could survive alone at sea for that long. But the measurement and milestones themselves serve as encouragement. He has already made it that long, he can certainly last just a bit longer. How do you measure success and sustainability in your business? Do you establish milestone dates for accomplishments and deadlines? Do you take into account tasks that take longer or shorter to complete, depending on their complexity? Toward the end of the film and novel, Pi lands briefly on an island that at first appears to be a paradise, or Garden of Eden. He finds food and a place to sleep, and is able to rest from his exhaustive months at sea, a welcome respite. But as night draws near, Richard Parker and the swarms of the now "celebrity" meerkats, freak out and head for the hills, as Pi learns that it is a carnivorous island that turns acid every night and feeds on itself, so to speak. From my reading online, this part of the story strikes many audiences as confusing, and some folks on Goodreads felt it should have been edited out. But of course, it exists for a reason. I think it's there to increase both the credibility and ambiguity of the story. The fact that the island cannot be mapped or found afterwards adds doubt to the story, yet the finding of meerkat bones on the boat further substantiates it. More paradox! The lessons on this one? Things are not as they appear. The first solution isn't necessarily the final one. Sometimes, we have to surrender completely before getting a second chance. True in life, as in business.